Allied Market Research recently published a report, titled, “Allergy Treatment Market by Type, Treatment and End User. The report presents comprehensive analyses of the global market by analyzing the market dynamics, top investment pockets, key player positioning, and competitive landscape. According to the report, the global allergy treatment market garnered $24.65 billion in 2017 and is expected to reach $40.36 billion by 2025, registering CAGR of 6.3% from 2018 to 2025. Increased prevalence of allergens and high consumption of tobacco that can induce several allergies drive the growth of the global allergy treatment market. However, patent expiries, competition from generic drugs, and availability of alternative and complementary therapy hamper the market growth. On the contrary, rise in awareness among patients regarding food allergies is expected to create lucrative opportunities for the market players in the next few years. The food allergy segment is expected to grow at the fastest CAGR of 8.3% during the forecast period, owing to rise in awareness among patients regarding food allergies. However, increased prevalence of allergic rhinitis across the globe helped rhinitis segment to garner largest market share in 2017, contributing about 40% of the total market share. The other segments analyzed in the report include asthma, skin allergy, food allergy, and others. In 2017, the anti-allergy segment reaped about 89% share of the market, owing to the increasing inclination toward over the counter drugs (OTC) for the treatment of allergy diseases. In addition, the segment is expected to continue its dominance over the market. 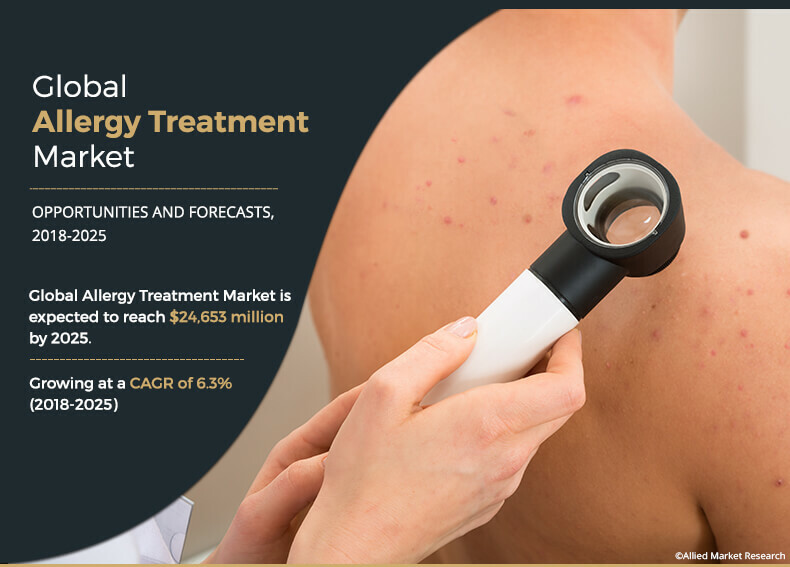 However, the immunotherapy treatment segment is expected to register the fastest CAGR of 8.5% during the forecast period, owing to increasing awareness among medical professionals regarding the use of immunotherapy for allergy treatment. The intranasal spray segment is estimated to register the fastest CAGR of 7.0% during the study period as intranasal sprays offer more promising approach to treat various allergic conditions. However, the oral drugs segment held the largest market share in 2017, contributing about 40% share of the total revenue, as oral drugs offer the convenience of self-administration, compactness, and ease of manufacturing. The other dosage form analyzed in the report include inhalers. The global allergy treatment market report includes several prominent distribution channels such as hospital pharmacies, retail pharmacies, and online pharmacies. In 2017, the retail pharmacies segment garnered about half of the total share of the market and is expected to continue its dominance throughout the market period. However, the online pharmacies segment would manifest the fastest CAGR of 7.9% from 2018 to 2025, owing to increased penetration of internet and surge in sales of medicines for the treat allergic reactions through online retailers. In addition, the hospital pharmacies segment would witness gradual growth in the region. North America contributed about one-third share of the total market revenue in 2017. It is estimated to lead the market throughout the forecast period, owing to the well-established healthcare infrastructure and increase in adoption in immunotherapy solutions to treat allergic diseases. However, Asia-Pacific region would portray the fastest CAGR of 7.5% through 2025, owing to rise in prevalence of various allergic diseases such as asthma and rhinitis in the region. The other regions analyzed in the report are Europe and Latin America, Middle East and Africa (LAMEA). The global allergy treatment market report includes various leading companies in the market such as GlaxoSmithKline, Allergopharma, Allergan, Inc., Schering-Plough Corporation, Collegium Pharmaceutical, Inc., Allergy therapeutics, Allergon, Genentech Inc., McNeil Consumer Healthcare, and Meda Pharmaceuticals, Inc. The market players have adopted several strategies including partnerships, collaboration, mergers & acquisitions, and new product launch to maintain its leadership in the market.